New findings suggest that one in six older adults is at risk for drug interactions. Should you be concerned? 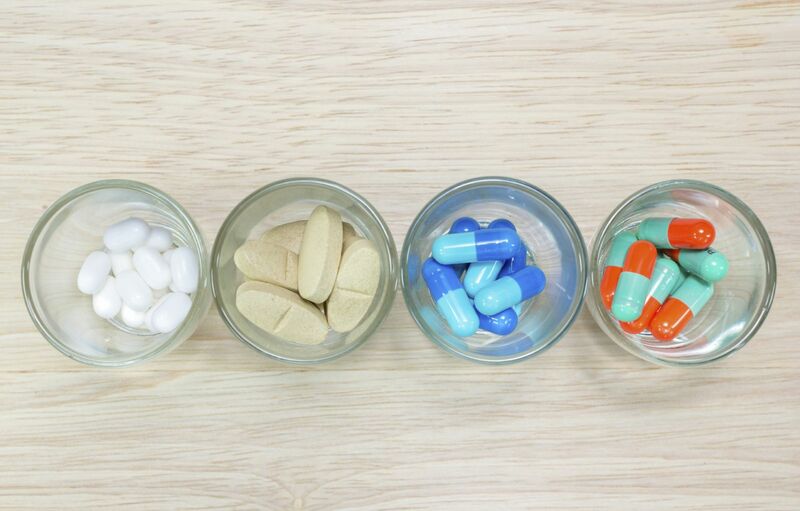 Earlier this year, a study that examined the pill-taking habits of older Americans suggested that seniors are taking more prescription drugs and dietary supplements than in years past. Not surprisingly, most of these pills are used to treat or prevent cardiovascular disease, the nation's leading killer. The report found that more than a third of adults ages 62 to 85 take five or more prescription medications, over-the-counter (OTC) drugs, or dietary supplements (see box for a description of the study). The study found that about one in six older adults is taking a combination that could cause a major interaction. Doctors use the term polypharmacy to describe the use of multiple medications—a practice that increases costs as well the risk of adverse drug interactions and side effects. The most commonly seen combinations of prescription drugs, OTC drugs, and supplements observed in this study are not necessarily dangerous. In fact, some are likely intentional, says Dr. Joshua Gagne, assistant professor of medicine at Harvard Medical School and a pharmacoepidemiologist at Brigham and Women's Hospital. "There are some circumstances in which using potentially interacting drugs is clinically appropriate," he says. For example, aspirin and clopidogrel (Plavix) are often prescribed in combination for people who've had a heart attack or received an artery-opening stent. Nearly 5% of those surveyed in 2010–11 were taking both drugs together, making it the most common of the potentially risky OTC–prescription drug combinations. Known as dual antiplatelet therapy, the combo helps prevent the platelets in blood from clumping together, which lowers the risk of heart attack and stroke. Both drugs also increase the risk of bleeding, which can be serious. But research shows that for most people who are candidates for this therapy, the benefits outweigh the harms, says Dr. Gagne. The most common potentially adverse interaction between two prescription drugs was with the blood pressure drug amlodipine (Norvasc) and simvastatin (Zocor), which lowers cholesterol. Amlodipine may slow the liver's processing of simvastatin, causing it to build up in the blood. This raises the risk of serious muscle damage. But the FDA recently issued guidance about this specific drug combination, noting that people can use them together safely if the simvastatin dose is 20 milligrams or lower. Many of the other possibly worrisome interactions involve the use of the anti-clotting drug warfarin (Coumadin), a drug with a well-deserved reputation for being finicky, notes Dr. Gagne. Many drugs, supplements, and foods interact with warfarin, causing it to "thin the blood" either too much (leading to dangerous bleeding) or not enough (leaving people prone to harmful clots). But all people taking warfarin should be closely monitored on a regular basis to make sure they're taking the correct dose. If you take warfarin and start or stop taking any other medication or supplement, be sure to get more frequent INR tests (which measure blood clotting time). Two dietary supplements, omega-3 fish oil and garlic, may also increase bleeding risk, although fewer than 1% of those surveyed took them with warfarin. But Dr. Gagne and most physicians agree that eating real food is a better way to add these products to your diet. Who: Two nationally representative groups of adults 62 to 85 years old. About 2,350 were surveyed in 2005–06 and about 2,200 in 2010–11. How: Interviewers went to the participants' homes and asked to see containers of all the medications and supplements they used on a regular schedule (daily or weekly). Why: To assess changes in medications and dietary supplement use over the five-year period. Concurrent use of at least five prescription drugs rose (31% to 36%). The biggest increases were in cholesterol-lowering statins and the clot-preventing drugs known as antiplatelet drugs. OTC drug use fell (44% to 38%). The most commonly used OTC drugs were aspirin, omeprazole (Prilosec), and acetaminophen (Tylenol). Dietary supplement use rose (52% to 64%). The most common were multivitamin/mineral supplements, which rose from 29% to 35%. Omega-3 fish oil supplement use increased almost fourfold, from 5% to 19%.